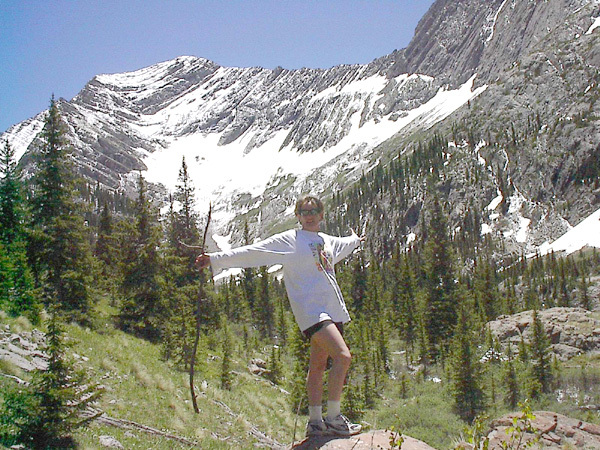 A hike up Crestone Mountain and a quick self-portrait — set the timer — now RUN! Crestone is a statutory town in Saguache County in Southwestern Colorado, United States. The population was 73 at the 2000 census. It is a small village at the foot of the western slope of the Sangre de Cristo Range, in the northern part of the San Luis Valley. Crestone was a small mining town, but little paying ore was discovered. In the 1970s, a large land development, the Baca Grande, was established to the south and west and several hundred homes have been built. The Crestone area, which includes the Baca Grande and Moffat, Colorado, is a spiritual and new age center with several world religions represented, including: a Hindu temple, a Zen center, a co-ed Carmelite monastery, several Tibetan centers, and miscellaneous New Age happenings. Crestone, Colorado is easily accessible to visitors, a National Forest Service campground is about 3/4 of a mile north of town and other lodging is available, including several bed and breakfasts. Activities in the area include camping, fishing, hiking, climbing, as well as spiritual explorations. Yes, I have the most fun with the self timed shots because I am usually the only one with color in my cheeks from running! Thanks! There’s something about mountains that I connect with in a spiritual way. Their strength, presence and stature all speak to me! Thanks for writing! ha. no that i think about it… i havnt taken a push and run shot for a while. now i just take a photograph of my shadow – or one at arms length. still fun to do self portraits tho. cool. aloha. When I first saw this post I thought you had run up the mountain. All I could think was how I would gasp for breath! I love Crestone. It is beautiful. Thanks for the shout out! I work at Casa Del Soul which is downtown Crestone at the base of the mountains. Do you live nearby? I live near Fort Collins but have been to Crestone 2x and simply adore it. There is something quite beautiful in the mountains, air and aura, don’t you think? I did not run but I hiked up this mountain (alone!) and decided to take my own photo – I had to set it and run like the wind to get into position before 10 seconds was up! What a fun day that must have been. I like photos that remind me of an accomplishment. Good effort! Yes there is something about the mountains that makes me feel so grounded. I feel the same way at the beach. I can’t be in a bad mood on a mountain or in the ocean. I lived there for 10 years, but eventually came back to California. I missed the beach and it got down to MINUS 55 degrees once!! That convinced me to move home. Luckily by staying in touch I am able to manage the website and marketing for CDS. The owner is a family friend.